Join us at Marché Mövenpick at Suntec City for the very first time. 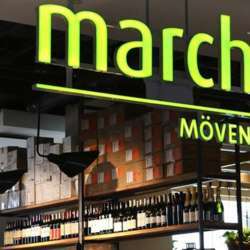 Marché Mövenpick a Swiss restaurant & bar in a setting reminiscent of a European market. Enjoy freshly shucked oysters at our impressive oyster bar while sipping exclusive Mövenpick champagne, wines and ice-cold German beer. Enjoy one complimentary glass of German Veltins beer/wine/soft drink. Don't forget to redeem your complimentary drink before 22:00. Special on food & beverage will be available, restaurant will extend a 10% discount on the consumption. There will be lucky draw prizes, so don’t forget to bring your card! Stand a chance to win 2 x SG$ 50.00 Voucher!! Feel free to bring your friends and colleagues along, but please invite them to join InterNations first! Kindly note that for registration fee only cash is acceptable/no credit card. How to get there: It is easily accessible via Promenade MRT or Esplanade MRT (circle line).